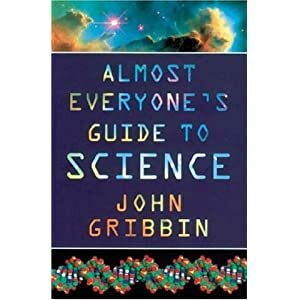 John Gribbin is a prolific science writer, with nonfiction books covering physices, biology and chemistry. His aim with this particular book was to give basic science information to the layperson, who was perhaps interested in quantum mechanics, but had never studied it before. He also wanted to link together all aspects of science, and takes us through atoms, to quantum mechanics, to chemistry, to DNA, life, evolution and the universe. Gribbin is obviously an expert, and does well writing for the amateur. Gribbin blends technical and informal language fluidly and coherently so the reader understands the terms in relation to their own lives and experiences. Gribbin uses anecdotes about eminent scientists to give readers an image of how science ideas developedthroughout history. He flows from one idea to the next, linking discoveries and scientists, and points to other chapters (or even books) where certain ideas are explored further. Almost Everyone’s Guide… is fascinating. It’s very interesting, and I honestly learnt a lot. It may seem strange but when you have an understanding of basic quantum mechanics (Chapters 1 & 2), it makes chemisty a lot easier to follow. Even though I have a degree in biology, the way Gribbin describes evolution is interesting and worth a read. This book would be great for someone like my Dad, who has a great interest in science, but no formal education in it. It is also a great starting point for someone (like me) who wants to brush up on their basics, and learn how to explain scientific ideas in an interesting way. Gribbin provides plenty of references for the reader to follow up on areas of interest as well as footnotes to further explain certain ideas. To me, this book seemed like A Breif History of Time, but for all the sciences. Rather than 11 chapters on pure physics, it has a physics backbone with chapters mainly on biology, chemistry or geology weaved throughout. Although, as Gribbin himself shows us, all of the sciences are so intertwined that you can’t write about one without mentioning the others. Although the content itself can be found elsewhere, the way in which Gribbin ‘tells the story’ of the universe and life is something I haven’t seen elsewhere. It really is a great starting point for scientific study. I would highly recommend this book to anywho who wants a more integrated understanding of science, or just needs to brush up on the basics. If I were to make any criticism, it would be that a lot of Gribbin’s descriptions would benefit from the inclusion of diagrams. For example, although atom electron shells and DNA structure are well described, it might be helpful to show the reader as well. I love libraries. I really do! I bought several A level revision guides when I was tutoring, since I thought it would be handy to have my own copies. Even taking out these I still have a pretty substantial reading list to get through. I can’t imagine how much it would have cost me if my library couldn’t get hold of them for me! On Tuesday I FINALLY finished my OU maths course (YAY!). All that means is that now I can start on my university reading list in earnest (yay?). 2. ‘The challenge of science education.’ Including how to teach science, and the problems this involves. This last section is quite a biggy! It recommends getting a hard copy of the national curriculum and GCSE and A-Level specifications for at least one exam board. It then recommends reading one GCSE text book in each of physics, biology, chemistry and geology. Then there’s at least 2 A-Level text books (biology and physics for me), and a degree level text book in your subject specialism (biology and physics for me again!). Although I’m glad to have things to do, and I appreciate how useful it is to know things in advance, I do wonder what they’re going to teach me during my SKE year.